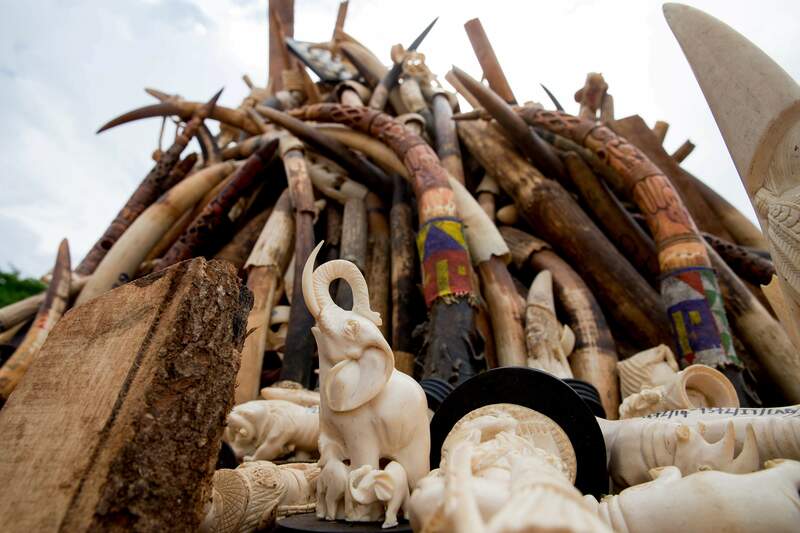 Ivory carvings and elephant tusks are placed in a pyre just before the first Cameroon ivory burn to highlight the need to halt the Ivory trade in order to save Africa’s elephants. The results of a new survey show a rapid decline in Africa’s savanna elephants as international and domestic ivory trades continue to drive poaching across the continent. 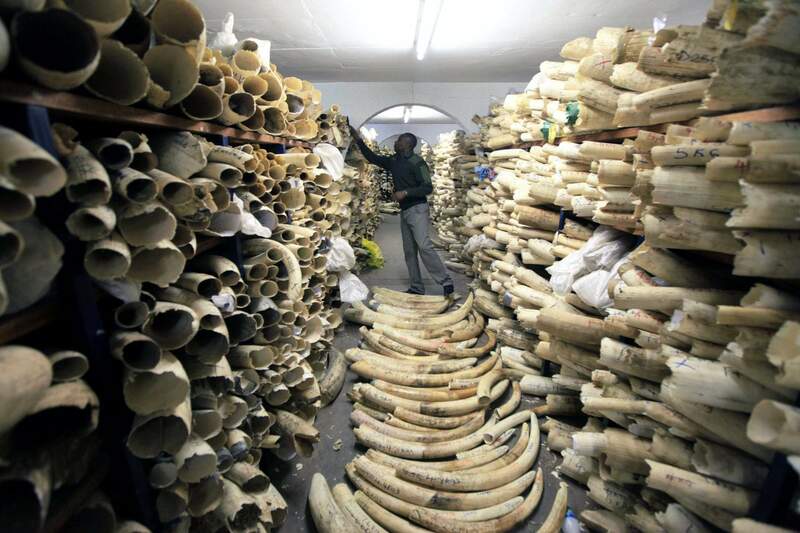 A Zimbabwe National Parks official inspects the stock during a tour of the country’s ivory stockpile at the Zimbabwe National Parks Headquarters in Harare. The results of a new survey show a rapid decline in Africa’s savanna elephants as international and domestic ivory trades continue to drive poaching across the continent. 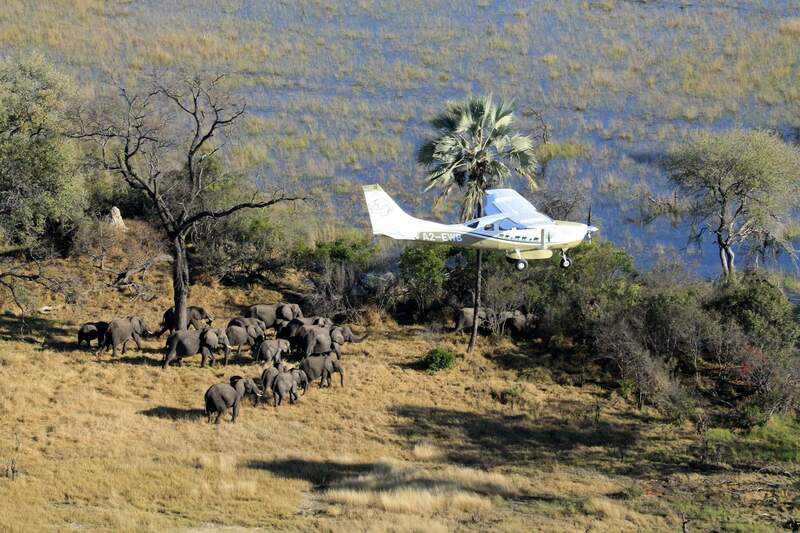 Scientists with Great Elephant Census fly over Botswana, Africa, during a survey of savanna elephants on the continent. The number of savanna elephants in Africa is rapidly declining and the animals are in danger of being wiped out as international and domestic ivory trades continue to drive poaching across the continent, according to a new study. The number of savanna elephants in Africa is rapidly declining and the animals are in danger of being wiped out as international and domestic ivory trades drive poaching across the continent, according to a new study. Africa’s savanna elephant population plummeted by about 30 percent from 2007 to 2014 and is declining at about 8 percent a year, said a survey funded by Microsoft co-founder and philanthropist Paul Allen. The aerial survey covered 18 countries using dozens of airplanes to fly the equivalent of going to the moon and partway back. The study, known as the Great Elephant Census and involving 90 scientists, estimated a population of 352,271 savanna elephants. Angola, Mozambique and Tanzania experienced greater population declines than previously known, and elephants face local extinction in parts of the Democratic Republic of Congo, Cameroon and Zambia, the study said. It also says numbers of elephants in South Africa, Uganda and parts of Malawi and Kenya were stable or partly increasing. Results of the study were announced ahead of the International Union for the Conservation of Nature World Conservation Congress in Honolulu. Allen, who provided $7 million for the effort, said he decided to launch the census after hearing three years ago that there had not been a comprehensive count of African elephants in decades. The research team used the limited existing data as a baseline for the study. But this survey is more comprehensive and will serve as a more reliable baseline for future observations, the team said. Its methodology involves manually counting animals while maintaining a specific altitude and following calibrated strips of land below the plane. The method is widely used for surveying animals on large plots of land and was the most accurate method of three tested on a known population in Africa, Chase said. The team also used video surveillance when counting big herds. Ivory trading that threatens elephants is banned internationally. But the domestic trade of ivory within countries is legal nearly everywhere. A motion being considered at the Hawaii conference seeks to change that by gaining international consensus to close all domestic ivory markets, noting that illegal killing of elephants for their tusks threatens national security, hinders economic development and endangers those tasked with protecting the animals. U.S. President Barack Obama and Chinese President Xi Jinping announced their commitment last year to combatting wildlife trafficking. The leaders promised to work toward a nearly complete ban on ivory imports and exports and an end to the domestic ivory trade. The decline in savanna elephants, like the dwindling numbers of African forest elephants, is directly tied to criminal poaching activities, some with ties to terrorist groups, according to Washington’s nonprofit Environmental Investigation Agency. “Trade in ivory has been a driver of destabilization wherever it occurs in Africa,” agency President Allan Thornton said. Thornton said one-time auctions of stockpiled ivory to China and Japan in 2008 resulted in a spike in illegal poaching, and the rate of decline among Africa’s elephants has been accelerating since. In areas with a high rate of population decline, the savanna turns into an overgrown thicket devoid of grasslands that sustain other wildlife and becomes overrun by disease-carrying tsetse flies, said James Deutsch, director of Allen’s Vulcan Inc. Wildlife Conservation. Furthermore, that land becomes useless for tourism when the elephants are removed, he said. “Once you remove elephants from parks, it becomes very hard to gain the political will to maintain those parks,” Deutsch said. U.N. Environment deputy head Ibrahim Thiaw said African nations are realizing that wildlife is worth saving because it brings in tourist dollars to fund education, health care and infrastructure.